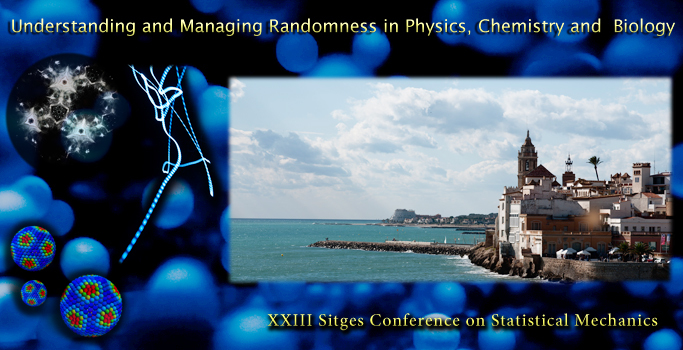 "The Photo Gallery has been posted"
The title of this forthcoming edition of the Sitges Conference will be "Understanding and Managing Randomness in Physics, Chemistry and Biology". In this Science Meeting, we intend to stimulate the discussion of fluctuation phenomena in small-scale systems in interdisciplinary science. The Conference Program will include the following topics: fluctuations in small-scale systems, nanomachines, artificial nanodevices and nanostructures; fluctuations in intracellular transport and in biological systems; forces induced by fluctuations and the Casimir effect; heat radiation at the nanoscale; aggregation and self-assembly of structures; stochasticity in materials, and in granular and active matter; fluctuations in confined systems and in systems with few molecules; mechanisms of generation and conversion of energy based on the presence of fluctuations; modeling of non-linear noisy systems. With the organization of this Conference, we will provide a unique opportunity to exchange points of view, to promote contacts and new collaborations, and to create a forum for debate that can help us to give answers to the many open questions in this vast domain of interdisciplinary research.